"The Satan Pit" / "The Impossible Planet"
There will likely always be conflicting reports as to when precisely Christopher Eccleston informed the production team that he was leaving Doctor Who, but there seems to be general agreement that the scripts for the second season were originally developed with Eccleston’s 9th Doctor in mind. I’ve always had some trouble wrapping my head around this one, because so many of the season’s stories seem driven by the joyous, demonstrative exuberance that David Tennant brings to the 10th Doctor. I can just about see how the Cybermen two-parter or today’s story could have worked with the 9th Doctor in the role, but it’s damn near impossible to imagine how Eccleston would have fit into “School Reunion,” let alone “The Girl In The Fireplace.” And yet, by all accounts, this season’s writers developed their stories and wrote at least their initial drafts with no clear sense of how Tennant would play the part, for the very simple reason that nothing had yet been filmed featuring the 10th Doctor in action. I’ve had trouble tracking down the precise interview, but I think it was Steven Moffat who said that he didn’t much adjust his approach to writing the show when Tennant replaced Eccleston, but the one piece of advice from Russell T. Davies that he did take on board was that Tennant had a gift for delivering big speeches. That last point feels especially relevant to today’s discussion, as this story features quite a few monologues from the 10th Doctor; in fact, he spends most of the second half of “The Satan Pit” either musing on the nature of faith while dangling above a pit of indeterminate depth or talking to a gigantic, mindless beast. I’ll get to those in a moment, but it’s worth considering how such lengthy oratory can both help and hinder the show. To that end, the criticism I recall most clearly when this season first aired in 2006 is that the episodes sometimes had trouble showing instead of telling what was going on; the Doctor would talk at length about who he was or what he intended to do to the latest alien threat, but Doctor Who was not always able to show the moments in the story that would give such grand pronouncements their proper weight. Indeed, the central reason why I consider the first half of this story to merely be very good while the second half is exceptional is that “The Impossible Planet” tells what “The Satan Pit” shows. The clearest example here is the Doctor’s reaction when he first learns of the expedition’s insane position. There’s some discussion of how it’s impossible for them to be standing on a planet that orbits a black hole, a quick demonstration of the Doctor’s genius credentials, a vague insinuation about the ulterior motives for the empire’s expedition, an earnest tribute to the human spirit, an exhortation to leave the planet as quickly as possible, and then the awful realization that the TARDIS could now be lost. These are all potentially important moments in establishing the Doctor’s relationship with the crew, but most of them aren’t given the time they need to land properly and the one bit that does—the Doctor’s paean to human adventurism—is so over the top that it’s hard to take seriously. David Tennant commits to the line, but it feels at odds with the mood of the room; it wasn’t so long ago that Zachary was talking about the dead man he has been forced to replace as captain. This scene is the primary opportunity to establish just why the Doctor would later believe, quite correctly, that Zachary trusts him enough to allow him to accompany Ida down the shaft. Yet I only really believe that later scene because of how Tennant and Shaun Parkes deliver their lines, rather than because of what’s clearly established in Matt Jones and Russell T. Davies’ script. I realize how nitpicky these criticisms are, but then there really is nothing so wrong with “The Impossible Planet” per se. This is a really good episode of Doctor Who, significantly better than anything that precedes it this season, “Girl In The Fireplace” excepted. Its struggles are a natural byproduct of how the new series tends to approach the two-parter structure. “The Impossible Planet” is the setup whereas “The Satan Pit” is the payoff, and it’s rare, even in a story with as much complex backstory as this, that you really need 45 minutes’ worth of setup. Because certain crucial character moves can’t happen until after the cliffhanger of the Beast’s reveal, this first episode is limited in how much it can explore its characters; the brilliance of the Sanctuary Base 6 team only becomes clear once Rose gets them to work together against the Beast, and that’s all in the second episode. This issue extends to the Doctor as well, as it’s only when he decides not to head down the pit at the start of part two that he acknowledges his vulnerability, which instantly makes him more interesting than the slightly presumptuous, high-handed alien of part one. Now, this Doctor’s struggle to engage properly with the emotions of humans is something I’ve discussed before—it’s the main reason why “Tooth And Claw” didn’t work for me, for a start—and, in fairness, this two-parter does seem to make a conscious attempt to bring the Doctor down, to place him in a situation where he is as vulnerable as the humans around him. It’s just that the story is a tad clumsy in how its sets up the Doctor’s lost invulnerability, with the Doctor and Rose’s initial laughter at the thought of leaving a particularly unappealing moment. The one scene in “The Impossible Planet” that displays the brilliance found throughout “The Satan Pit” is the Doctor and Rose’s discussion about what they will do now that the TARDIS is seemingly lost forever. While I would have liked to have actually seen the Doctor placed on the duty roster—as much as I like how the scene plays, the Doctor’s position might seem still more hopeless if he were considering his future while actually doing the laundry—the mere discussion of getting a house is a powerful illustration of the Doctor’s alien nature. The scene recalls a similar moment toward the end of “The Girl In The Fireplace,” in which a temporarily stranded Doctor promised to pay for any damage, then seemed to discover as he was talking the matter through how little he understood the implications of that promise. Here, he struggles to grasp what it would mean to live without the TARDIS, listing random details of things a house would possess because he can’t get his head around the core concept. All those little things we humans take granted are foreign to the Doctor, and it’s great to see that point brought home so clearly. Rose responds by suggesting that the two could get a house together. In theory, this should be an uncontroversial proposal; after all, if they aren’t living together in the TARDIS, I don’t know what else to call it. But that living arrangement was on the Doctor’s terms, which could be left pleasingly ambiguous. Rose’s idea is to share a house in human terms, and the implications of that are unmistakable. She fumbles around trying to find the right words to discuss such a delicate concept, but there’s little doubt of what she’s trying to get across. As before, it’s the Doctor who hesitates here, changing the subject from implicit romance to Rose’s mother, which likely isn’t a coincidence. The Doctor chooses that precise moment to reassert his role as Rose’s protector, her interstellar chaperone, and that closes down this topic of discussion once more. Later, as the Doctor prepares to fall into the pit, he suggests Rose already knows what he’s going to say, but I’m not so sure. Yes, this Doctor has a knack for long speeches, but he’s defined just as much by the things he chooses not to say. So, the Ood. I made one the image for this review, because they’re such instantly striking aliens, but I have to admit that they don’t actually do that much in this story. They serve admirably as the Beast’s army, but they basically swap being enslaved by humanity for being enslaved by Satan, with little indication of what, if anything, might lurk underneath. There are some lovely moments right at the end of the story, as the Doctor admits that he didn’t have time to save the Ood and Zachary closes out the story by recording the death with honors of each individual Ood, but there’s a lot of untapped potential here. 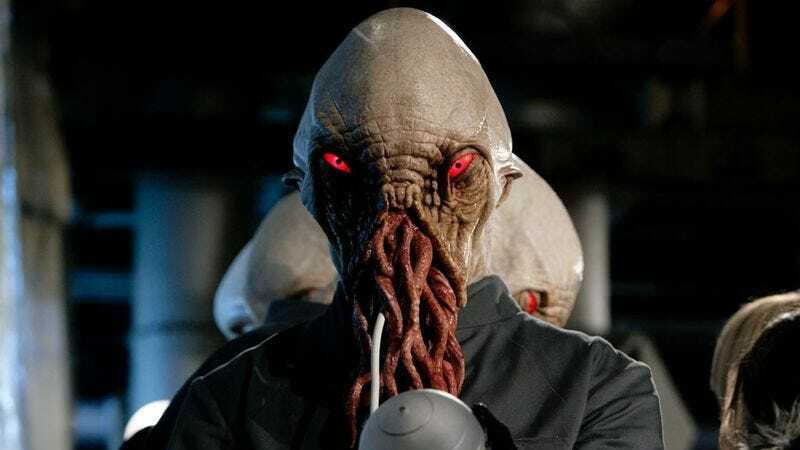 Thankfully, the fourth season episode “Planet Of The Ood” does an admirable job exploring all the big questions about the Ood. Gabriel Woolf is absolutely terrifying as the Beast, and yet this isn’t even the scariest villain he has voiced in Doctor Who’s long history. Ladies and gentlemen, may I present Sutekh, last of the Osirans. This Week In Mythos: The Ood recall the Sensorites, an alien race from the very first season. The Doctor makes reference to the Draconians from “Frontier In Space” and Daemos from “The Daemons,” not to mention the Kaled God of War, which means the humanoid predecessors of the Daleks apparently had some sort of polytheistic pantheon. The Doctor also mentions that the Time Lords effectively invented black holes, which are used as power sources for TARDISes. Sometimes, the Doctor is the narrative equivalent of an invasive species. If we look at the first two seasons of the revived Doctor Who, there are some story types into which the Doctor naturally fits. Stories in which he faces off against iconic foes, like “Dalek” or the Cybermen two-parter, fall into category, and the Doctor has been defending the Earth from alien invaders for so long that it might as well be his day job. And there are stories that could really only be told in the context of Doctor Who, either because they require the Doctor’s presence to jumpstart a more experimental tale—“Father’s Day” and “Boom Town,” for instance—or because their premises are just so bold, outlandish, and frequently goofy—“The Girl In The Fireplace” and “New Earth” are both examples, albeit with varying degrees of success. That leaves stories that don’t fundamentally require the Doctor but are warped and transformed by his presence. Consider the two celebrity historicals, “The Unquiet Dead” and “Tooth And Claw.” It’s not hard to imagine the existence of a ghost story featuring Charles Dickens or a werewolf story starring Queen Victoria. But once the Doctor shows up, the ghosts become interdimensional, gaseous aliens and the werewolf becomes an alien parasite. When faced with the impossible or the supernatural, the Doctor remakes the narrative environment so that it’s something he understands. After all, there’s no particular reason why, say, the Gelth are more plausible than ghosts; sure, aliens are easier to fit into a rationalist worldview than the paranormal, but there’s nothing particularly scientific about how the aliens behave in that story. And anyway, all that leaves aside the basic fact that the Doctor uses what is essentially a big magic box to travel through space and time. Doctor Who runs on a slight paraphrase of Arthur C. Clarke’s famous law, as any magic is indistinguishable from sufficiently advanced technology, but it’s always the Doctor who gets to do the distinguishing. What makes “The Impossible Planet”/“The Satan Pit” so brilliant is that the story refuses to bend to the Doctor’s will. This two-parter is a piece of (relatively) hard science fiction with tricky, ambiguous themes about the nature of faith, and it never quite turns into a Doctor Who story. The Beast defies the Doctor’s attempts to categorize him, with a particular sticking point being the matter of just where—or, more accurately, when—the creature originates. The words “Time Lord” are never specifically used in this story, but it isn’t hard to make the connection when the Doctor reveals his fundamental objection to the Beast is the idea that he comes from before the universe, rather than beyond it. Even when the Doctor confronts the Beast’s mindless husk, he still finds himself unable to grant that one premise. But then, that’s exactly what allows the Doctor to emerge victorious. Faced with the impossible, the Doctor rejects it, treating the Beast’s origins as a blank space and then talking around it. In doing so, the Doctor overcomes his own fear that the Beast was attempting to play upon, and it allows him to make the Beast small enough to defeat. The monster’s victory depends on everyone treating it as though it were invincible, and that means the Doctor must treat it as unknowable. Once the Doctor decides the Beast’s prison is still bound by the same laws of logic as the rest of the universe, he quickly intuits that his seemingly miraculous survival is just the penultimate move in an ancient chess game between the unseen Disciples of Light and the Beast, and the final move is to destroy the planet. The question of what the Doctor believes in dominates much of “The Satan Pit.” If I were feeling uncharitable, I would extend my initial argument and suggest that the Doctor’s only religion is that he is the protagonist of Doctor Who; in other words, the Doctor travels the universe secure in the knowledge that everything he encounters will ultimately make sense in terms he understands. But the Doctor does recognize the arbitrary nature of the rules he lives by, and he finds himself drawn into a broader discussion about faith. He mostly takes an anthropological viewpoint, and one could imagine this episode delving more explicitly into Time Lord religion (or lack thereof) if it had been made slightly later on in the series. Still, such discussion would likely just be clutter to the Doctor’s main articles of faith, much of which he actually spelled out back in “The Impossible Planet.” Much as I wasn’t the biggest fan of the Doctor’s tribute to the human spirit, it’s not hard to see why that’s so important to him: Humans in general need to be worth saving, and Rose in particular needs to be worth dying for. More to the point, Rose needs to be worth sacrificing in the name of defeating this impossibly powerful foe. The Doctor has come a long way from his state of mind in “World War Three,” in which he hesitated to save Earth from the Slitheen if it meant losing Rose and breaking his promise to Jackie. This two-parter reaffirms that promise, yet the Doctor ultimately risks breaking it, saying that, of all the fake gods and bad gods and demigods and would-be gods, the one thing he truly believes in is Rose herself. This statement is easier to get behind when Rose has proven so crucial in rallying the Sanctuary Base 6 crew against the Beast, but I think this statement is better understood independent of Rose’s story-specific actions. The Doctor of last season could not bring himself to risk Rose’s life because he was so invested in this particular companion; he was determined to keep this one human safe at all costs, because it would prove that he could trust himself again after the dehumanizing horrors of the Time War. But this season’s Doctor has progressed, and he now believes that the ideals that Rose believes in and represents are more important than her specific existence. We’ve seen Rose captured enough times to know she would tell him to smash the urn and destroy the Beast, and the Doctor is finally willing to follow that implicit order. The miraculous recovery of his TARDIS feels like a just reward for such faith. All these issues that the Beast forces the Doctor to struggle with make this two-parter feel different from the typical Doctor Who story, but part of that effect is down to the Sanctuary Base crew. At first glance, the key members of the expedition all fit into basic archetypes, with the characters fulfilling roles that are instantly familiar to anyone who has seen this sort of sci-fi story in classic Doctor Who. Zachary Cross Flane is the well-intentioned captain who feels duty-bound to ensure the safety of those under his care, even when that means doing something he knows is wrong. Ida Scott is the scientist whose inquisitive streak threatens to get her killed. John Maynard Jefferson is the gruff security chief who is far too quick to solve problems with a gun. Danny Bartock is the coward who is liable to lose control of himself at just the wrong moment. Toby Zed is the technical expert who finds himself consumed by a force he can’t even remember, let alone understand. Scooti Manista is satanic cannon fodder. Doctor Who needs recognizable characters such as these when telling a story as complex as this two-parter; even then, a substantial chunk of “The Impossible Planet” is taken up with explaining the plot. If these characters were never developed beyond these basic types, they could still be compelling on the strength of the performances, a point that we’ll circle back to in a bit. But the genius of Matt Jones’ script—one heavily rewritten by Russell T. Davies, to the point that he’s suggested he should have at least a cowriter credit on the two-parter—is how it respects these characters as people, and that becomes especially obvious in “The Satan Pit.” So many stories over the past two seasons have defined supporting characters’ worldviews in terms of the Doctor and Rose’s own perspective; guest characters are invited to live up to the example set by the TARDIS team, to be improved by their presence. That isn’t necessarily a problem—indeed, part of what makes Doctor Who special is its clear moral compass—but it’s refreshing to see characters who are capable, even kind people without first being lectured by Rose. Yes, her recognition of what the Doctor was driving at before the Beast cut him off is vital to their success, but his argument that they all need to band together would carry no weight if the expedition members had nothing to offer. The escape through the unventilated ventilation shafts depends on some brilliant teamwork by all of the humans; “The Satan Pit” accomplishes the seemingly impossible task of making a man sitting at a desk and pushing buttons into riveting television. Some of that is because of the Ood threat, but it’s also because Zachary’s every action has been positioned as a triumph of the human spirit. Credit here must be given to Shaun Parkes, who stands as my favorite guest star of the second season, narrowly edging out Sophia Myles as Madame de Pompadour and Claire Rushbrook as Ida Scott. (I’m leaving out Elisabeth Sladen on the technicality that she’s a returning series regular.) Parkes has to hit a tricky sweet spot as Zachary; he has to reveal the character’s compassion and self-doubt while still making him believable as the acting captain of an interstellar expedition. Zachary has no uniform to indicate his heightened status, and he lacks the body language that would mark him out as a trained leader, so Parkes instead focuses on conveying the essential decency of his character. When Zachary decides to take Rose onto the rocket against her will, this could so easily feel wrong, yet another example of an officious military man who blindly follows proper procedure instead of placing his trust in the Doctor. But when Zachary makes that call, Parkes conveys just how conflicted he is about ignoring Rose’s stated wishes. When he says he has lost too many people today, the audience feels the grief, the defiance, and the resilience that underpin those words. He acts as the Doctor would in that situation—just about the highest compliment one can pay to a supporting character—but he does so because it’s what he personally feels is right. Claire Rushbrook is similarly impressive as Ida Scott. 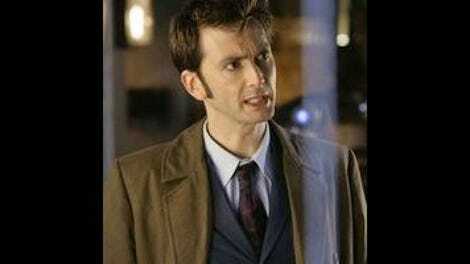 Like Zachary, this character could so easily exist just to make the Doctor look better. She shows a worrisome lack of caution in how she approaches the mysteries of the pit, and it would be so easy to make her a cautionary tale for the Doctor, a narrative sacrifice to enable his journey onward and downward. But the story keeps her around right to the end, letting her function as a conversation partner for the Doctor as he mulls over the nature of the Beast. Much like Tennant, Rushbrook has to deliver most of her best lines while wearing a spacesuit and talking into a communicator, which makes the clear compassion and humanity of her performance all the more impressive. Danny Webb also deserves recognition for his work as Jefferson; the security chief has all the makes of a one-note character, but Webb brings a gruff warmth to the character that makes him feel real without sacrificing the character’s edge. Indeed, one of the script’s wisest decisions is that it never bothers to explain just why Jefferson’s wife never forgave him, because it knows the past doesn’t matter. The story allows Jefferson to be defined by what he does in the here and now, rather whatever transgression he may have committed in the past. To spend time on this doubtless juicy bit of backstory would be to grant the essential correctness of the Beast’s position, and everyone involved is smarter than that. Jefferson has a job to do, and he doesn’t allow some predictably tortured past to get in the way of that work. Really, that’s just another aspect of the brilliance of “The Satan Pit.” This is an episode that understands that it doesn’t need to tell you anything as long as it shows you all you need to know about the people who inhabit its world. Maybe the entire two-parter is not an unqualified triumph, but it’s still damn impressive, and it’s an exhilarating example of what Doctor Who can be at its most fearless. Admittedly, not every character onboard Sanctuary Base 6 is quite so clearly drawn or forcefully played. Indeed, the one downside of investing so much time in developing the main supporting characters is that it’s particularly obvious when the initial Ood attack kills off all the expedition members we weren’t specifically introduced to. If I have one lingering issue with “The Satan Pit,” it’s the fate of Toby Zed. The script leaves it ambiguous as to whether Toby is ever himself again once the Beast takes him over; while a line here and there indicates that he is under the Beast’s influence even when his eyes aren’t glowing red, it’s not clear whether Toby would have been all right once the Beast’s body is destroyed, which the Doctor suggests would destroy its mind as well. If that’s the case, then Rose’s decision to kill Toby—complete with the action movie one-liner “Go to hell!”—feels like a violation of the high-minded principles that she very specifically embodies. It’s not a major issue, considering I have no problem giving this story the highest possible grade, but it’s a dangling thread that I wish the story had addressed just a bit more clearly. “The Satan Pit” really has to be the greatest title in the show’s history. I am willing to hear about possible competitors for that title, but my goodness, that title is awesome. Next week: It’s time to talk about “Love And Monsters” and “Fear Her.” To quote another iconic time traveler: Oh boy.